Heavenly blog! : Nr. 384: World's best news is the gospel and the good news of Jesus Christ! Nr. 384: World's best news is the gospel and the good news of Jesus Christ! World's best news is the gospel and the good news of Jesus Christ! This is from my commentaries Hebrews 2 3 How shall we escape if we do not care about the salvation that is so much bigger? It was first announced by the Lord, and since confirmed to us by those who heard him. This letter is addressed to the church in Jerusalem. Reference points on how big and wonderful that God did through Jesus and the first Christians we have in the four Gospels and the Acts. The church here was not really come out of this business of Jesus and the Apostles. 4 God also the testimony by signs and wonders and various miracles, and by sharing the gifts of the Holy Spirit at his will. This is mentioned here that was not foreign to them. That God himself had confirmed the message with the accompanying signs and handed out by the Spirit among them. They were people with firsthand knowledge. But now they were about to depart from this. I think we all at all times is about to be pulled away from the simple and obvious reason truths from God's word. Want to show that Jesus is the good news and the message even in his own person sent from God. The message and the good news is Jesus Christ. But what is gospel and what is the good news? Want to take me some pages of the Gospel - that is the gospel - what we need and to present people. And this is as much teaching to believers as it is a presentation of not believing what the gospel is. The gospel is the good news - the bad! I've heard many people say that we need to spread Christianity. In the Bible we find no such concept as to spread Christianity. In Norway, we introduced Christianity by force. In 1995 it was celebrated that it was 1000 years since Christianity came to Norway. Gospel means good news. Is not it just great news we need today? We inundated with bad news from every corner, through newspapers, television, radio, Internet, etc. What is the gospel of the kingdom of God? Yes, Jesus died on the cross. There, he took on all the sins of the world. He rose from the dead and lives today. Gospel of the kingdom of God is that Jesus did not impute our sins, but that all who come to Him will receive forgiveness of all their sins. Jesus said in Mark 4:15: "Repent and believe the gospel." He did not repent and believe in Christianity, but repent and believe the gospel. What is repentance? The turn to Jesus in childlike prayer and accept the forgiveness that Jesus has paid for all when He died on the cross. Repentance means to turn, that turn against Jesus and let Him be Lord of your life. Jesus says in Matthew 18.3: "Except ye be converted, and become as little children, ye shall not enter the kingdom of heaven." The Bible says that the gospel of the kingdom of God is so simple that even a fool will go astray, we often make it difficult for people to accept the gospel of the kingdom of God. Often we tell people about everything they can and should do, often we focus on what is sin and what is wrong. We should rather have the focus on Jesus has taken all the sin and all the wrongs we have done on the cross and that He offers us forgiveness of sin. Paul says in Romans 10:13, "For whoever calls on the name of the Lord shall be saved." What does the gospel - the good news? First, I will mention what the gospel is not! 1) This is of course a very big subject. But the gospel is not to engage in politics and charity on behalf of God. Through politics, sports, charity and much else that in itself is good, one must be allowed to point out that today this is not the gospel. The gospel is to point to Jesus as the Savior of the world and the road to the only true God, Yahweh or Jehovah! 2) The gospel is not to point out the law as the way to salvation and to meet God as such Adventists are doing in a too large extent. What they are doing is a total derailment of the gospel. We do not believe in Jesus and so keep the law. There are only four things that Gentile Christians should keep the Law of Moses, all else are we exempt from. Here are the four things that we Gentile Christians to keep the Law of Moses: Acts 15. 28 For the Holy Spirit and to us not to put any other burden on you than these necessary things: 29 that ye abstain from things sacrificed to idols and blood and things strangled, and fornication, if ye keep yourselves from these things, it will well with you. Farewell! The gospel is to preach the word of the cross, not the gospel of the kingdom! It blends many concepts and different time in households. The gospel is to preach the message of the cross that died there the Son of God (not God). For all people regardless of race and gender. And through and through faith in his death the eternal life. This is from my commentaries Markus 13 10 And the gospel must first be preached to all nations. Notice the wording here mentions Mark's Gospel. In Matthew 24 14 And this gospel of the kingdom will be preached in the whole world as a testimony to all nations, and then shall the end come. Jews, especially the 144,000 book of Revelation speaks of the end time preaching the gospel of the kingdom - 1000 årsriket. But we as pagans but also Jesus believing Jews have the preaching of the gospel and the cross in the center. 1. Cor. 1. 18 For the word of the cross is foolishness to those who are perishing, but to us who are being saved it is the power of God. The way I see it, there are nodes up to Jesus' death and resurrection for us. And that through the gospel as it is no longer someone who has an advantage over other Jews who had it. But can all the blood of Jesus to God to become children of God and partake of divine filiation. This is from my commentaries Gospel of John that I'm doing: 1. 12 All who received Him, to them He gave the right to become children of God - those who believe in His name. The Word says that He gave them the right to become children of God. That means that anyone who received Jesus, He gave the authority to become children of God. Accepting Jesus is the same as believing in his name. The term "name" is that Jesus is anointed by God to be the Saviour of the world. In the Old Testament, the king, prophet and priest (chief priest) anointed. Thus we speak of Jesus' threefold mission. He is king, prophet and high priest. He is the king of the whole universe. He is a prophet who preaches the word of God, and he is the high priest who carries himself to God as a vicarious sacrifice. 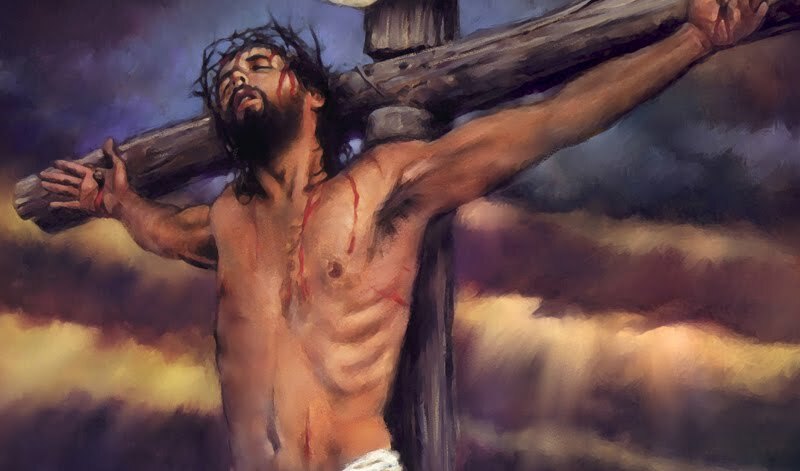 Jesus Christ took all the sins of himself up on the cross and took the punishment on himself and died as a sinner and a criminal and was buried. Death could not hold him for his death, he died to sin, but the life he lives to God. So he stood up for our justification. Scripture says: "Him who knew no sin, God made sin for us, so that in Him we might become the righteousness of God" 2 Cor 5:21. Therefore, whoever takes refuge in Jesus and go to him with their sins and failures and believe in him, justified and are a child of God. He is born of God, that he is born again by the Spirit of God. 13 They are not born of flesh and blood, not by human decision or a husband's will, but born of God. At the new birth are the penitent sinner saving faith and a new heart and a new setting. It is a miracle of God's grace that happens in the individual's heart when God's word first gets to show the sinner's true standing with the holy God and opposition to God ceases, and the gospel will make his merciful deed. 14 And the Word became flesh and dwelt among us, and we beheld his glory, the glory as of the only Son from the Father, full of grace and truth. V.14 to be the center of gravity in the prologue. It is instructive to examine the way the verse is built on: First, we get two sentences that say something about the Word: the Word became flesh "and ... dwelt among us. " Then follows a main clause that says something about the church reception: We saw his glory ". The rest of the verse explains further the glory of it is about, first by saying where it comes from (as the only begotten Son of the Father "), then by saying what it consists of (full of grace and truth"). Let's look at these five sentence elements one by one: 1) Word became flesh " So easily the biggest mystery in the history of the world is expressed. Three little words. But after reading about the Word divine rank in v1-5, so it's really groundbreaking to imagine that this divine logos entirely too would become a human like us. This was unheard of for a Greek mindset that despised creation. (Cf. v.3). It created was the second-class and inferior. How can God stoop to become one with it? This was madness for a Greek logos-philosophy (1 Cor 1.23). Those who would gain the right knowledge and insight into the secrets of abstract thinking, the audience will: Logos became man, was born on a particular day and died on a particular day. Logos could be seen, heard and taken (cf. 1 Jn 1.1 to 4). It was a blasphemous thought for Jews. They could probably be far when it came to distinguish between different aspects of God, as we saw in terms of wisdom theology in v1-2. But to say that the wisdom of God was made man, it was totally uantakelig. When exceeded Mon border between God and the created, and was guilty of the grossest blasphemy. It is here in v. 14 John comes to what really distinguished Christianity from these other religions. This was so boldly said that the church should fight by understanding it for centuries to come. But it was a wonderful thought for all who place their faith: this means that God is not distant, but that he fully shares our plight! We call this miracle of incarnation. In Greek, it says that the Word became flesh, which in Latin is incarnatus, or nynorsk: ikjøting. Christ - the Son of God - possible birth into a life where he really carries a mortal body, so he must feel both hunger and thirst, cold and sorrow, loneliness and pain. It's pretty amazing that we have such a Christ believing! 2) .. dwelt among us " Also this is an unprecedented view of a Jew. God had chosen his dwelling in Israel: First in the tabernacle that accompanied the people of desert journey (2 Gen. 40.34), since the temple in Jerusalem (see temple dedication and Solomon's prayer in 1 Kings 8.10 to 13). But now says v.14 that God gets his home in Israel by word. Thus it is said indirectly that the temple is past. Now is the presence of God related to the person of Jesus. We find the same theme clearly expressed in the 2.13 to 22, where Jesus after tempelrenselsen proclaims itself as the new temple. See also John 4.21-24: The future of divination is not linked to a specific place, but will be in spirit and in truth. Then we Christians to flock to a particular shrine in a particular place to seek God where He may be found. The person of Jesus is now the important meeting point between God and man. Are there more questions? Send your questions to me or write your comments and opinion on this blog, be blessed in Jesus' name. The Gospel speaks of Jesus atoned the sin at Calvary, and there he defeated Satan and all his spiritual army. From my commentaries Colossians Dispenser letter 2 14 Debt letter that went against us because of the commandments, he strode out and took it away by nailed it to the cross. The debt was just bigger and bigger the older you were and to bring in together made usually hurts worse. The law has really only had one purpose, to show us our true condition and nature. Rom.3. 20 For no man is justified by works of the law. By law we become conscious of sin. But Christ came with white paint and did everything again figuratively. All of our sins, past, present and future hangs on Calvary. The people we know and those we do not know about. Is this good preaching? I mean it. They are nailed there and do not come on. He brushed it out and away. 15 He disarmed the rulers and authorities and put them up to the scorn and derision when he triumphed over them in it. Satan and demos has had on our lives. We were in the dark and thrived in the dark and was Satan's property. But they were disarmed and moved forward as liars, accusers and without real power. Satan and the demon had been ravaged long and hard enough. But not anymore, now they were defeated. The victory is complete. God the Father is fulfilled through Jesus' work at Calvary. We have sins forgiven and God can take us to the grace and adopt us into his family as his own children. And Satan and demon has no real power anymore, they are living on borrowed time! Jesus resetting of the law for us believers. It does not long for us, only grace in Christ Jesus.